(O lord) This body all of ignorance. of everything that belongs to the earth! in love we call for Gaura-Nitai! O Lord, this material body is a place of ignorance, and the senses are a network of paths to death. Somehow, we have fallen into this ocean of material sense enjoyment, and of all the senses the tongue is most voracious and uncontrollable; it is very difficult to conquer the tongue in this world. But You, dear Krsna, are very kind to us and have given us such nice prasada, just to control the tongue. Now we take this prasada to our full satisfaction and glorify You Lord Radha and Krsna -- and in love call for the help of Lord Caitanya and Nityananda. may You be the object of my vision! Jagannâtha is the name of Lord Krishna as the Lord of the Universe. Baladeva is the name of Lord Balarâma: (strenght of joy) Krishna's first Plenary portion operating as His older brother. Also named Râma and Sankarsan. He is the protector and teacher of the devotees. is also considered Bhagavân. Subhadrâ was the sister of Lord Krishna. She married with Arjuna after the battle of Kuruksetra. Subhadrâ was the mother of Abhimanyu who was the father of Emperor Parikchit to whom the Bhâgavatam was spoken. Shrî Jagannâtha is the "Immovable Lord of the Universe." He is a primal expansion of Lord Vishnu, second in the Vedic Trinity of Brahma (Creator) Vishnu (Sustainer) and Shiva (Transformer) and, for at least the past five thousand years, is greatly beloved throughout the Indian subcontinent. 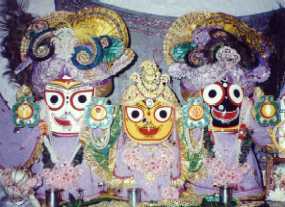 The fourth of India's four holiest temples is dedicated to Him (jagannath Puri). Now, thanks in part to the universal awakening of eclectic universalism in its many forms, His popularity is quickly expanding throughout the entire world. "O Kesava! O Lord of the Universe! O Lord Hari, who have assumed the form of Lord Balarâma, the wielder of the plow! All glories to You! On Your brilliant white body You wear garments the color of a fresh blue rain cloud. These garments are the color of the River Yamuna, who feels great fear due to the striking of Your plowshare." "All glories to Rama-ghata, where Lord Balarâma performed His rasa dance. All glories to Lord Balarâma, the son of Rohini. All glories, all glories to the residents of Vrndavana." "Powerful Lord Balarâma is sixteen years old, full of the luster of youth and has a fair complexion the color of crystal. Balarâma wears blue garments and a garland of forest flowers. Balarâma's handsome hair is tied in a graceful topknot. Splendid earrings adorn Balarâma's ears. Srî Baladeva's neck is splendidly decorated with garlands of flowers and strings of jewels. Splendid armlets and bracelets ornament Douji's graceful and very strong arms. Balarâma's feet are decorated with splendid jeweled anklets. Srî Baladeva is Srî Krishna's dearest friend. Baladeva is a great reservoir of the nectar mellows of many kinds of transcendental pastimes." "Lord Balarâma's beauty is enhanced by the earrings touching His cheeks. Balarâma's face is decorated with tilaka made from musk, and Balarâma's broad chest is ornamented with a garland of gunja. Srî Baladeva's complexion is as white as an autumn cloud, and He wears blue garments. Balarâma's voice is very grave and His arms are very long, touching His thighs." "The splendor of Lord Balarâma's transcendental form eclipses many millions of glistening rising moons, and the slightest scent of His boundless strength is sufficient to destroy many armies of demons. Although He knows the supernatural power of His younger brother, Krishna, still, out of love for Him, Balarâma never leaves Krishna alone in the forest even for a moment. I offer my prayers to Lord Balarâma, the enemy of Dhenukasura." "The Supreme Personality of Godhead, Krishna, is the fountainhead of all incarnations. Lord Balarâma is His second body. They are both one and the same identity. They differ only in form. He is the first bodily expansion of Krishna, and He assists in Lord Krishna's transcendental pastimes. That original Lord Krishna appeared in Navadvipa as Lord Caitanya, and Balarâma appeared with Him as Lord Nityânanda. May Srî Nityânanda Rama be the object of my constant remembrance. Sankarsana, Sesa Naga and the Visnus who lie on the Karana Ocean, Garbha Ocean and ocean of milk are His plenary portions and the portions of His plenary portions. Lord Balarâma is the original Sankarsana. He assumes five other forms to serve Lord Krishna. He Himself helps in the pastimes of Lord Krishna, and He does the work of creation in four other forms. He executes the orders of Lord Krishna in the work of creation, and in the form of Lord Sesa He serves Krishna in various ways. In all the forms He tastes the transcendental bliss of serving Krishna. That same Balarâma is Lord Nityânanda, the companion of Lord Gaurasundara." When will such mercy fall to this one who is weak and devoid of strenght and intelligence? Allow me to be with you. If you examine me, you will find no qualities. Your mercy is all that I am made of. If you are not merciful unto me, I can only weep, and I will not be able to maintain my life. Your absence from my vision is like a dose of strong poison, and I will suffer till the end of my life. Narottama dâsa Thâkura says: "Please give me your mercy and the shade of your lotus feet."